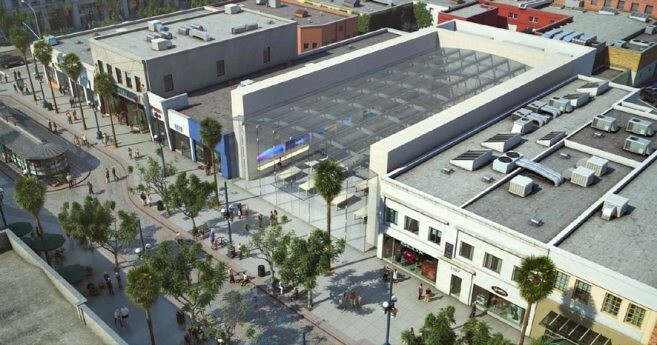 Although Apple’s name still is not mentioned in paperwork accompanying a 8,084-square-foot project at the Third Street Promenade (where Apple already operates a smaller store), said to feature the spectacular glass ceiling and the front façade, media outlets don’t have the slightest doubt that this in fact is an upcoming flagship Apple store. Just 24 hours after it came to light, city staff apparently greenlighted the project, reports Santa Monica Dispatch. As it does with all commercial projects, City staff prepared a detailed staff report on the Apple project (though it did not mention Apple and purported not to know who the actual builder was), complete with renderings, and, as it virtually always does, it concluded that the commission should approve the project and it should go forward. The surprise was that the staff put the project on the Consent Calendar. I cannot remember any large, complex commercial project ever going on the Consent Calendar. Apple was the only item on last night’s Calendar. And, under the rules, the Consent Calendar is approved as a whole – unless someone wishes to pull at item for discussion. And in that crucial blink, the commissioners approved the Consent Calendar (aka Apple Glass House), and that was that – except for a staff report on the redesign of the Project Case List, after which they adjourned. Per project documentation, the store will have a 5,210-square-foot basement and the front façade consists “entirely of transparent glass panels that will project five feet from stone paneled side walls”, in addition to an all-glass ceiling. Apple is also said to offer full-time retail employees a $100 monthly transit subsidy towards the purchase of transit fare and a $20 per month bicycle reimbursement subsidy for improvements, maintenance, and service. Also, secure bicycle parking for employees of the building is reportedly in the cards as well.